H omeopathy can both help support acute mineral deficiencies and chronic long-term ones where one seems to be unable to assimilate certain nutrients from their food. The common ones that I see in my clinic are iron deficiencies but calcium can also be an issue both in young growing infants but also in menopausal women. Other minerals that are deficient in our soil, such as zinc, can become useful homeopathic remedies in the process of bringing our clients towards health. Homeopathy helps the body come into balance. If a client tends to be lacking in iron, showing symptoms of being tired, exhausted and irritable just before their menses then Ferrum phos 6x can be taken twice daily the week before the period and during. It will support the bodies iron levels at this time and will help to reduce or eliminate the symptoms of tiredness. However, if a client is taking iron supplements but struggling with the side effect of constipation, taking Ferrum phos will help the body tissues readily make use of the extra iron supplements but reduce the side effects. In essence the homeopathic remedy helps to balance the body tissues ability to absorb and use the mineral effectively. Homeopathic remedies under 12c in potency still contain easily absorbed microdilutions of the original substance that they are made from. If a body is not absorbing the mineral that they need from a good healthy diet then saturating them with extra doses of mineral supplements does not necessarily mean that the body will assimilate it any better. 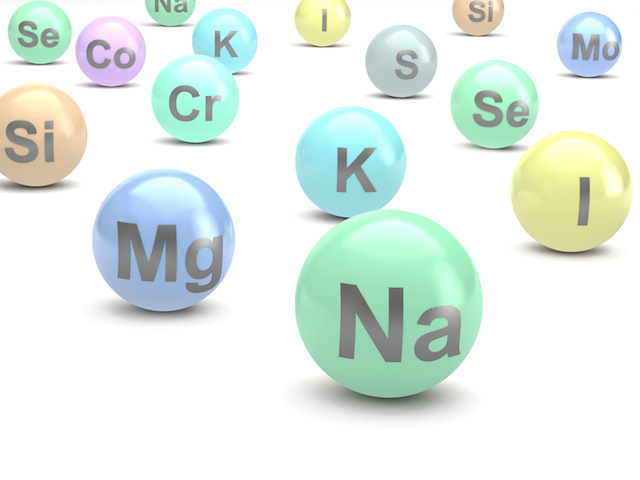 Homeopathic low potencies are a great way of supporting mineral supplementation. If the person has had repeated occurences of a mineral deficiency, such as anaemia, then clearly there might be a chronic obstacle in the person’s ability to assimilate that mineral. These sorts of chronic mineral deficiencies can be hugely helped with constitutional homeopathic treatment. When treating a client constitutionally for a chronic tendency to a mineral deficiency we must look at the deeper underlying issues. How a person responds under stress is an important consideration and is explored deeply in a homeopathic consultation. Each mineral not only has physical clinical symptoms but also a pattern of behaving under stress that will appear frequently in a person’s life. If this pattern under duress can be related to the clinical mental and emotional symptoms of the remedy, then we have a very good fit for the remedy and it has a good chance of helping to repair the body’s ability to assimilate the necessary minerals properly. My personal experience was that for much of my life I suffered with iron deficient anaemia. It did not matter whether I ate meat or dried apricots or wheelbarrows full of spinach and lemon juice, for some reason I could not absorb iron properly in my diet. The keywords and mental symptoms of iron (Ferrum) include persevering firmly in either their jobs or situations in their life. However people needing iron will often push on with a task even when it feels heavy or burdensome and there are, seemingly, outside forces making completion of that task a struggle. People needing Ferrum can also be very sensitive to criticism and although they work hard it can feel like there is so much more to do. The remedy Ferrum phos was a wonderful support for me in my iron deficient periods and rarely did I have to resort to an iron supplement. The remedy that completely healed me of my reoccurring anaemia though was the mineral remedy Samarium which is a few rows down directly under Iron in the periodic table (see the figure below). This remedy still had the deeper essence of the burden of perservering against all odds because those symptoms are common to all the minerals in the same column as Ferrum in the periodic table. However this particular mineral suited me better constitutionally as it is a remedy that wants to help others and to build a structure (business) to enable me to help others. I took this remedy as I was preparing to set up in practice as a homeopath and not only did it cure my recurrent anaemia but suddenly the preparations for my business flowed smoothly. Resources were made available to me enabling me to set up my business, where before I was sure I would have to struggle to find them. This is an example of a great constitutional prescription where the mineral deficiency was key to finding the correct remedy that matched the whole being on a deeper level. Here are some other minerals and their corresponding symptoms that when matching a person’s constitutional picture and prescribed homeopathically, may help in many areas of their health and mental outlook. Calc Carb: The classic picture of the bonny baby, breastfed but perhaps a wee bit chubbier than it should be. Is shy in new situations and has terrible trouble during dentition. They are often constipated. This baby is not absorbing the Calcium in it’s milk very well and therefore having difficulty during it’s developmental period where the body is requiring extra Calcium for growing. In the adult requiring Calc carb, they will also be overweight or despite eating well, cannot seem to shift those extra kilos. If female, they may be having problems with menopausal symptoms. The main keynote in an adult is an underlying anxiety about their family, the future and financial security. They will often get anxious about presenting their ideas to others at work as they may be criticised. This remedy is wonderful during pregnancy due to the increased need for calcium at this time and the tendency for mother’s to start thinking about the future after baby comes…perhaps they will be going down to one income or wondering if they will cope or even worrying about baby’s health. A pregnant mother with these mental symptoms will be greatly soothed and notice an increase in energy with homeopathic doses of Calc carb during her pregnancy, at the discretion of her homeopathic practitioner. Phosphorus: Fantastic for growing pains, either by itself in a 30c potency or as Calc phos 6X in a Schussler Salt potency. This helps the body during times of growth and high demand on it’s phosphorus stores. The pains can be in the muscles but are also often in the long bones and at the joints such as the knees. Often I have my clients telling me they give Mag phos for these symptoms with only little success. In this instance, Phosphorus by itself should be tried as the mental symptoms of this remedy are often common to when this significant growth spurts are happening during preteen or puberty years. A child needing Phosphorus will love communicating and being with their friends. They will tend to be confident and may have difficulty getting to sleep at night. They love company and so will be in and out of bed just to see what everyone is doing! Concentration spans are often helped with this remedy. It is an important mineral for growth and development. Zinc: An important remedy for eczema, particularly on the inner legs. Zinc is deficient in our soils. A person needing zinc may be repeating the same routine over and over in their life. I often need to give this remedy to students especially if they are sitting exams. A key factor in the clinical picture of this remedy is that often the routine is overdone so much in their effort to perform that they actually become mentally tired, unable to take in any more information. I remember being in this state at university. Any of these remedies given in low potency will gently support the physical body to assimilate their minerals better but if the mental picture matches the remedy essence, then much deeper healing can take place with the higher potencies, 30c and above. Always consult with a qualified homeopath as they can best support you in your journey with the mineral kingdom.